We get it, farming has been in your family for generations. Every day you wake up under the twin suns and wring whatever moisture you can out of the desert. It’s not the most lucrative life, but it’s noble, and someone has to do it. The problem is that you can see--in the eyes of your child--the need for something more. She really wants to get off the farm for bigger and better things. You know what you have to do right? Obviously, tell her to fix up those droids you just picked up and to stop going on about power converters at Toshii Station. 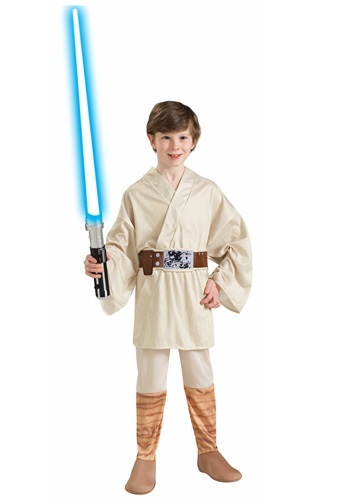 But, if you want to tap into better parental instincts than good old Uncle Owen, then maybe consider getting her this Kids Luke Skywalker Costume–it’ll help her access that greater potential and inner strength to seek out her destiny. We mean, sure, maybe be careful about letting her hang out too much with the old hermit on the other side of the desert, and shooting womprats from an aircraft may not be the most…ethical past time in the world, but this costume will let her imagine herself in Luke Skywalker’s shoes, and will let her allow her hidden Jedi powers to surface. Who knows, maybe someday she’ll help save the Galaxy from an evil Emperor just like Luke did. In any case, your little one can look just like the great Tatooine hero with this ivory tunic and matching pants and boot covers, with a foam belt. To complete the look, make sure to accessorize with a lightsaber. Now let your little one get out there and explore the world beyond the moisture farm. Just remember, avoid the Tusken Raiders and don’t trust those Jawas.